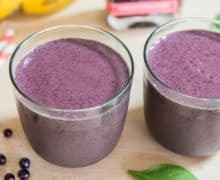 Blueberry Banana Smoothie - Only 5 minutes and 6 ingredients to make it! 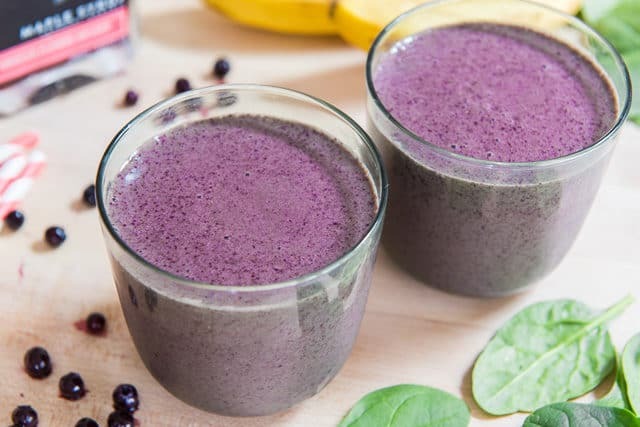 This Blueberry Banana Smoothie only requires six ingredients, and manages to be both healthy and delicious. It’s a great breakfast option and only takes 5 minutes to make! While I’m not a smoothie every morning kind of person, I do get a hankering for one every few weeks or so. They’re creamy and sweet, and a cinch to make. My position on smoothies is that they should strike a balance between healthy and delicious. I do want nutrition to my smoothie, but I also don’t want to feel like I have to choke it down because it tastes wretched. (Raise your hand if you’ve had those kinds of smoothies 😂). 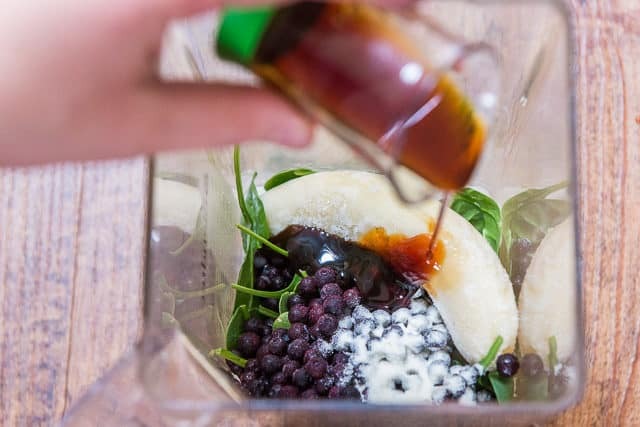 Case in point: this green smoothie recipe I posted long ago that I almost titled: “A green smoothie for people who don’t like green smoothies.” Taste matters too! 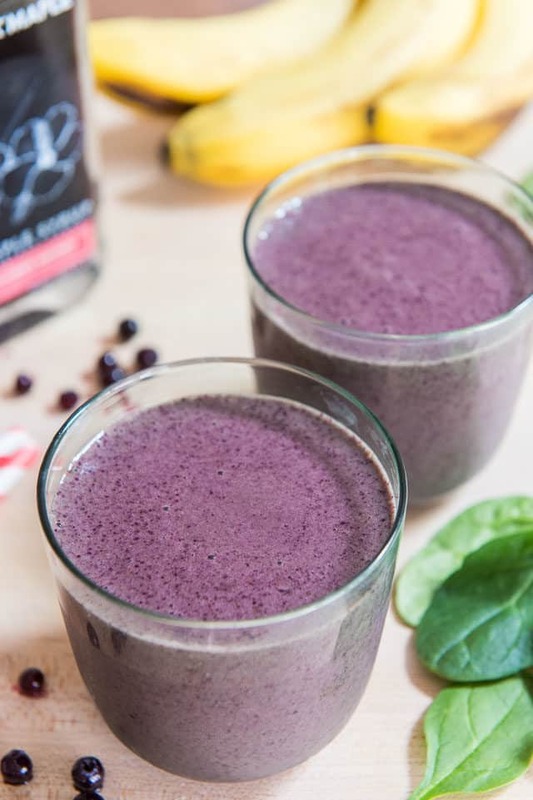 You have your fruit component, extra vitamins and fiber from the spinach, collagen powder for a boost of protein and other benefits, and a touch of maple syrup to sweeten and add flavor. And with the cashew milk, it’s dairy-free, but feel free to use regular milk if you prefer. You could also use almond milk if that’s what you have. Side note: I recently bought all the nut milks I could get my hands on and did a taste test of them. Here’s The Best Tasting Almond Milk and Cashew Milk post in case you want a guide. Brands vary hugely, more than I expected! 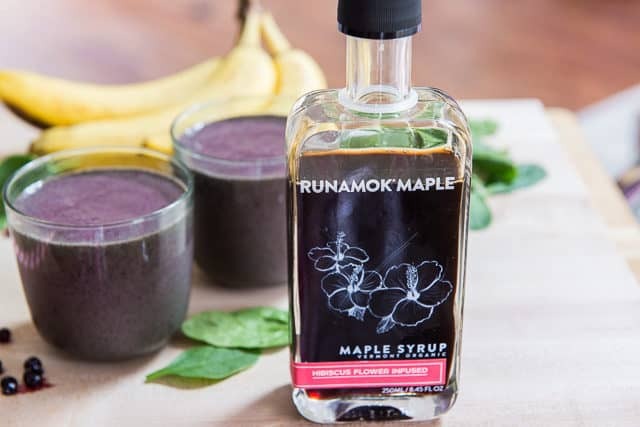 For the maple syrup, I’ve got a bunch of Runamok Maple‘s infused and barrel-aged syrups in my fridge, and tried adding their Hibiscus Flower infused maple syrup, knowing that hibiscus has a flavor affinity with blueberry. 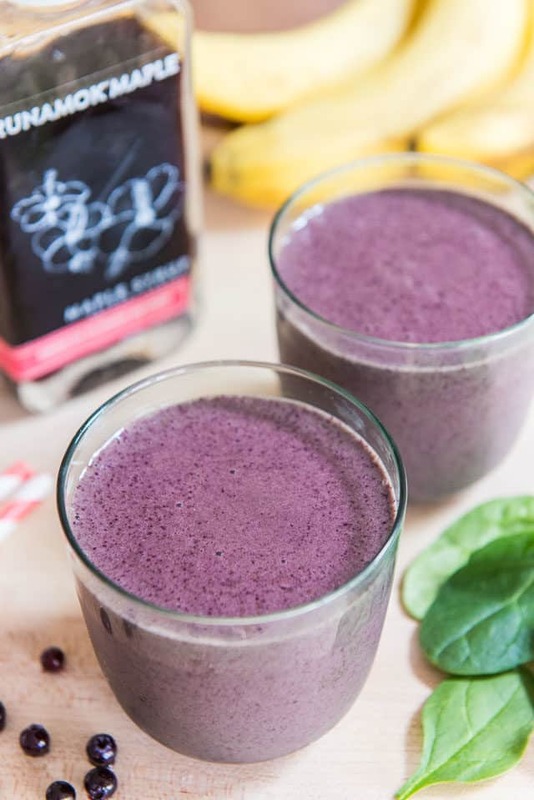 It added an interesting flavor note and a little sweetness to the smoothie that also helps “hide” the collagen and spinach a little bit. Let’s just say that James drank a whole cup of this smoothie and was clamoring for more. I’d call that a success. Whenever I buy a bunch of bananas and they start to get black spots, I’ll peel them and throw them into a bag in the freezer. They’re perfect to use for smoothies, or for banana bread. They keep really well in the freezer, plus they give the smoothie that wonderful frozen creamy texture without having to add ice. 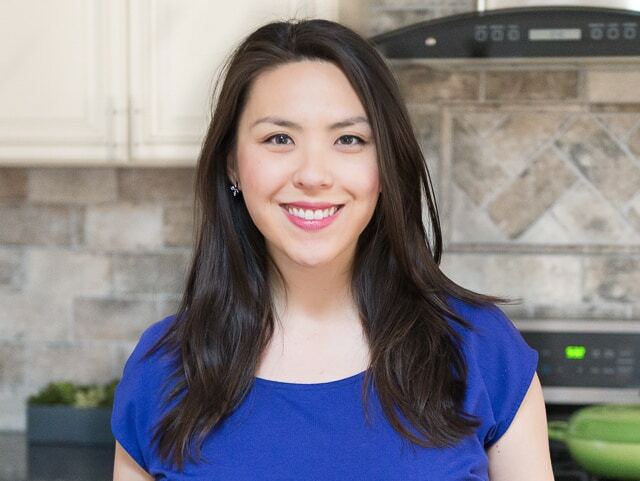 Feel free to tweak the ingredients to your taste, and use the amounts as guides to experiment with. I love that there are a million combinations when it comes to smoothies. Enjoy! *Use 1 tablespoon if you'd like a slight sweetness, or 2 tbsp if you like it a little sweeter. You can also use regular maple syrup, or omit the sweetener entirely.